Best potty training books: What can help your little one to go? Today we have a guest blog from Natasha Radford. She is a primary school teacher, as well as the owner of Chicken and Frog Bookshop in Brentwood (which she runs with her husband James). She is looking at some of the best potty training books available for you to help your little one in their journey to the potty. So why not check these out, and combine them with our great potty training track charts for the perfect potty training package! I can honestly say that making the transition from nappies to potty was one of the most anxiety-filled periods in my life as a mum. When you’re at home with your little darlings it’s fine if they have accidents (albeit frustrating), but when you’re out and about the blood pressure rises rapidly as the ‘I need a wee’ dance begins and you realise that the nearest toilet is on the other side of town! However, we made it through, three times with three very different children and so can you. One of the most powerful tools to our success (apart from a lot of smiling through gritted teeth and an awfully large amount of spare pants) was books. I have reviewed four books for this blog and hope that they help you through. The first on the list is Who’s in the Loo? By Jeanne Willis. This is not a book which takes you through the steps of potty training, in fact there’s not a potty or nappy in sight. 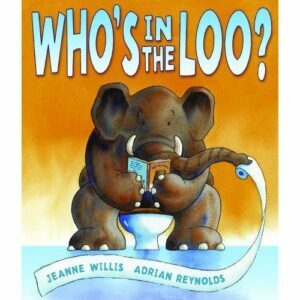 But, what it does do is normalise using the toilet, through a great deal of humour and fantastically vibrant illustrations from Adrian Reynolds. Best potty training books: Who’s in the Loo? This is a perfect book to read aloud with your children, as the rhyme is pacey and the hilarious possibilities as to who is indeed in the loo will keep your child engaged throughout. Sharing Who’s in the Loo? With your child before beginning the process of potty training may well go a long way to allay any worries that they may have about using the toilet. My second and third choices are written by the same author, Sue DiCicco. She has created Superhero Potty Time for boys (although I think that girls would enjoy it too) and Princess Potty Time for girls. 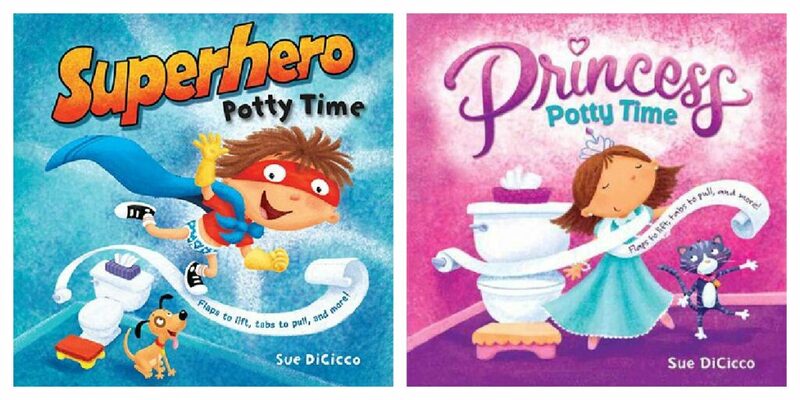 Superhero Potty Time and Princess Potty Time are both interactive books, which invite your child to lift flaps and spin wheels as they learn all about using the potty. They are created from sturdy board, which is sure to stand the test of time, as well as the occasional possible throw across the bathroom floor! The illustrations are bright and fun, drawing the child in without them feeling intimidated by the subject matter. I would recommend these books to children from the age of 18 months, depending upon when you feel that they are ready to take steps towards becoming dry. 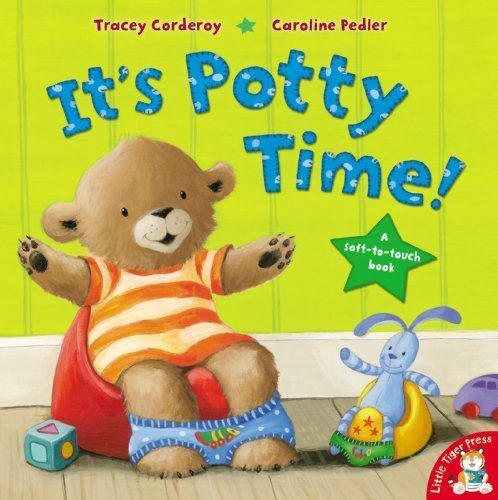 And my final book is It’s Potty Time by Tracey Corderoy and Caroline Pedler. This is a very sweet, touchy feely book, which follows Baby Bear and his rabbit, Barnaby, as he learns how to use the potty. It’s not always easy, but Mummy is there to help and reassure Baby Bear. Not only does this book give your child a real sense of what the potty is all about, it also provides parents with some handy tips. Mummy Bear really knows her stuff, allowing Baby Bear to play with the potty, making it a part of everyday life, before actually using it for its true purpose. It’s Potty Time is available in both paper and hard back formats, although not in board book form which is its only downfall in my opinion. There are a whole host of other books out there too. The most important thing to remember is that you will succeed in time and don’t listen to the mum who tells you that her 18 month old child was dry within a day – it’s either a fib or a very lucky fluke! Thanks to Natasha for this; and remember there is not necessarily a right age and no magic time for when to start potty training – the most important thing is to try and keep your patience, and remember it isn’t actually a race at all! Did you have any books you used to help with potty training? What worked for you? Do let us know below.